Are you thinking of putting up a bat box? If so, it could be the start of a very rewarding relationship. One in which you benefit from having natural insect control (among other things) and aids bats by providing them with a place to roost. Insect eating bats are very sensitive creatures that need suitable places to sleep during the day and hibernate in the winter. Factors like the loss of roost sites have led to decreasing population levels for some bat species. Bat houses can play an important part in bat conservation. They can be put up in a variety of places but high up on trees and buildings by the eaves are the best sites. Along with habitat loss, another threat to bats is chemically treated wood. So the timber used definitely needs to be untreated. bat houses that face a south-east to south-west direction will be warmed by the sun for part of the day. Summer is when bats in the northern hemisphere have their babies (known as pups) and warm (but not too hot) temperatures are needed during this critical period. Having two or more of them on the same tree but facing different directions means they can move from roost to roost if required. a cool but not too cold environment is needed to make sure the bats don't lose too much energy while hibernating. So a north facing one would be best. One way to extend the life of a wooden bat box is to cover the top with polythene to protect it from the weather. Those that are made from woodcrete (a mixture of wood and concrete) tend to last much longer and maintain stable temperatures better than wooden ones. Whether you're going to buy or make your own, one very important feature is the width of the entrance. Found at the bottom of the box in most designs, it mustn't be more than 1.5 to 2 cm wide. This will stop most other animals from getting in. To increase your chances of attracting bats to the boxes, install them close to places that have lots of insects. Places like ponds and hedgerows. Did you know that bat poop or guano makes an excellent fertilizer? It's even sold commercially because it's so good! 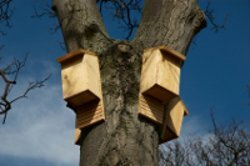 By having bat boxes in your garden, you'll have your own source which you can collect once your furry guests have left. (Disturbing a roost can be disastrous for a colony and is illegal in the UK). If you'd like to try making your own bat box, here's a free bat house plan from the Bat World Sanctuary. You can either click on it to view it in your browser or right click on the link to download this pdf file to your computer.